Welcome! 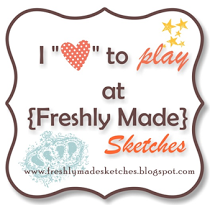 (If you have just arrived here from Shirley's blog, then you are on the right path!) Our June 2010 Stamp of the Month is D1422 Wonderful Friend. I really like this stamp set, so as you can clearly see here, I have already been using it A LOT!! 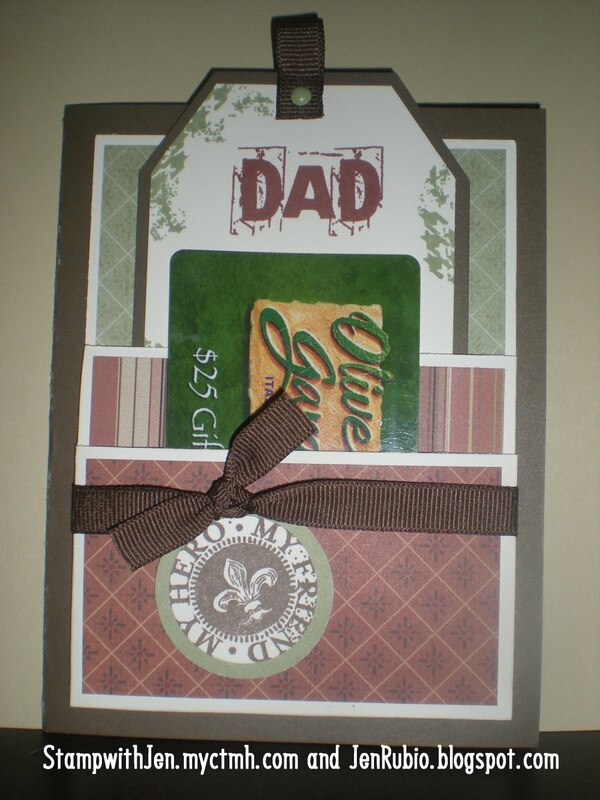 Most of my creations this time feature the Passages Level 2 paper pack X7126B with Barn Red, Cocoa, and Garden Green inks (unless otherwise noted). 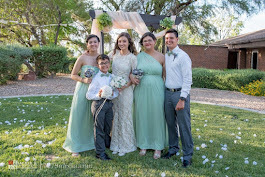 Remember you can click on all of my photos to see the details up close if you want to! My circle card (below) uses liquid glass to do the "cracked glass" technique! The pocket watch is first stamped with timber brown Staz-on ink to keep the image from running/bleeding when the wet liquid glass is added! The cutting dimensions and directions how to create this easy standard size "double pocket card" (below) can be found on Splitcoast Stampers! 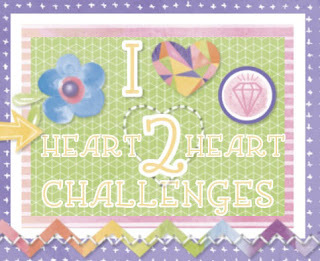 You may recognize this card (below) as the NEW title topper for my blog (up top) that I made for the H2H8 challenge and told you about in the previous blog post before this one! and if you'd like to see a photo tutorial on how to make the "Crescent Moon Paper Flower"
to my blog post dated May 22nd!! Now, you can continue on with the hop by visiting Deb Young's Blog next!! Enjoy! This weeks Heart 2 Heart challenge was to create something using stamps for your background. 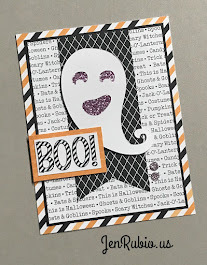 I was inspired by Helen O's card and knew that I wanted to use the fun "argyle" looking stamp from the upcoming June SOTM - D1422 Wonderful Friend. 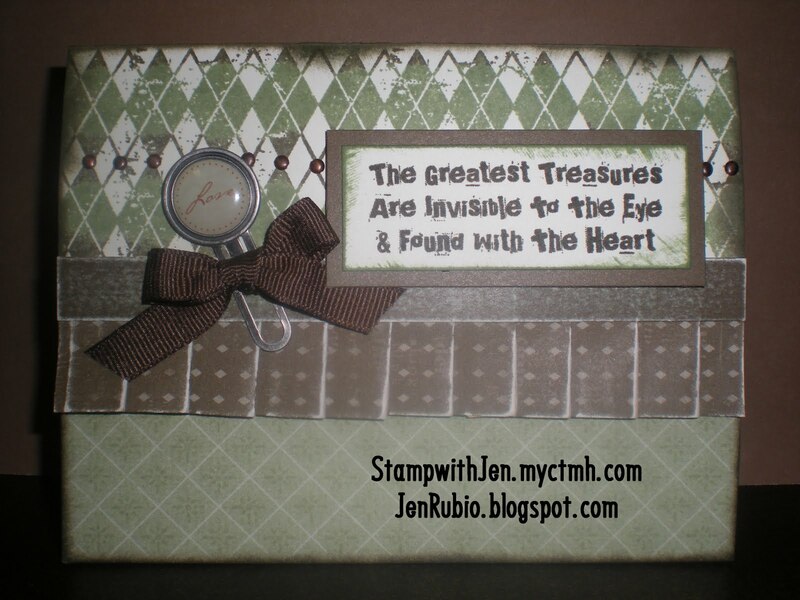 This is my standard size card that resulted, also inspired by Wishes - Lucky Layers (p. 27). 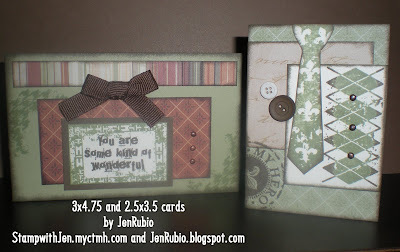 I used the "stamp-rolling" technique to give my argyle background a two-tone effect (garden green ink, rolled with cocoa ink at the top and bottom of the image). I also added a folded paper ruffle that I've been wanting to try making for so long now using B&T from the Veranda paper packet (I sanded the B&T ruffle with sandpaper to give it that "well-worn" look). 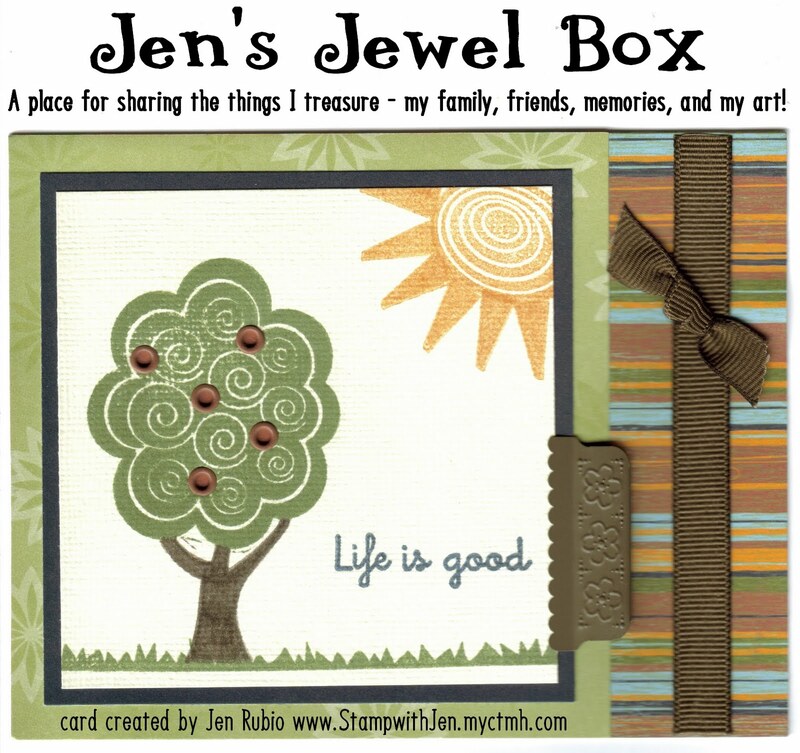 Well, it turns out that I like my card enough that I decided to use it as the NEW topper for my blog (yaay!! It's about time, right?!) 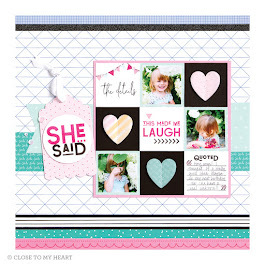 I hope you like the change as much as I do, as I was getting tired of seeing the same card there for so long - since last Summer (you can see my old blog topper in the post before this one if you want to remember it fondly with me, lol). Out with the old and in with the NEW!! 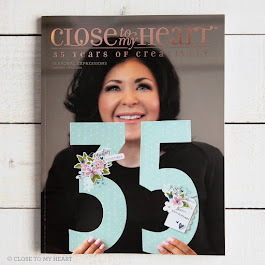 **Update: I was thrilled to discover this morning (6/4) that this card was chosen as one of the Friday top 5 on the Heart 2 Heart challenge blog!! You can see that post by clicking here! 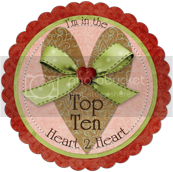 Yaay - I am so excited - thank you for the honor ladies that chose me!! 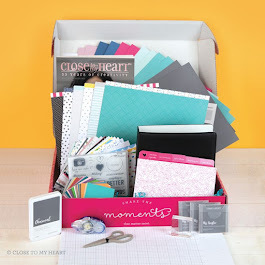 I just wanted to say a happy "farewell" to my old blog topper! I will remember you fondly - lol!! "Crescent Moon Paper Flower" tutorial! Today was a good day (exhausting, but good). I got up early to drive out of town to attend a CTMH consultant team meeting most of the day at my 3rd upline Cindy Baker's house in Menifee (about a 2 hour drive for me). The "creative" theme for the day was learning how to make all the different kinds of paper flowers that are so popular right now! Several different consultants shared and taught us how to make different varieties of flowers. It was so fun and I learned a whole lot!! You can bet I'll be sharing more flower ideas with you in future blog postings, but I learned way too much to share it all at once. 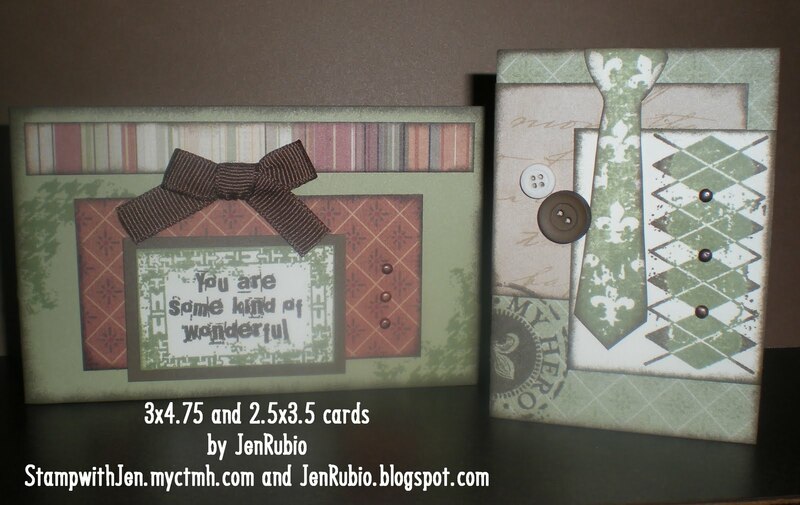 The 4x4 criss-card (shown above) is the little project that I provided and taught everyone how to make! 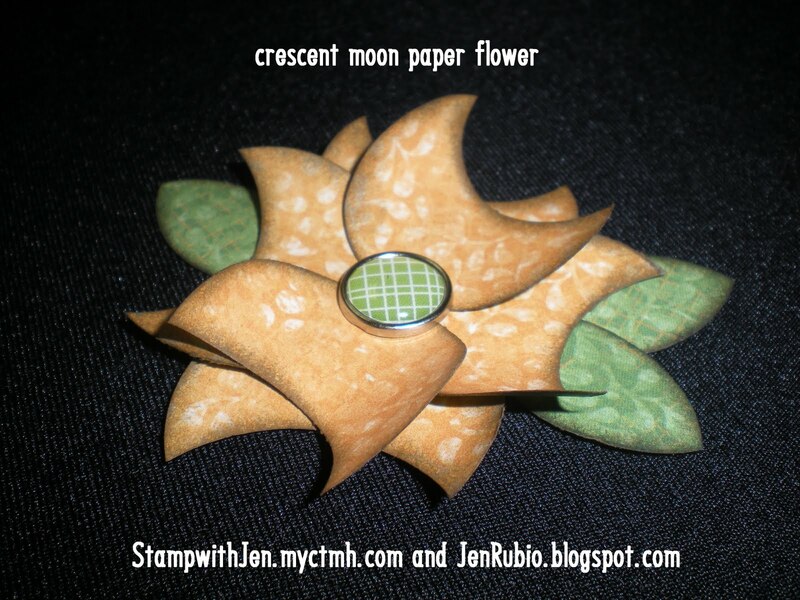 The "crescent moon paper flower" I taught is created with our NEW 1.25" circle punch that I have enjoyed using so much recently! 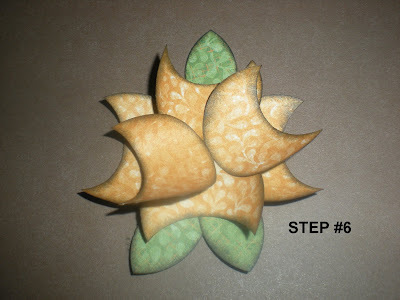 These flowers are much simpler to make than they appear (I'm all about faster, simpler, and easier lately!!) 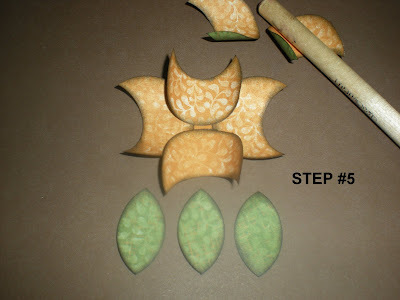 Please enjoy this photo tutorial on how to make them! 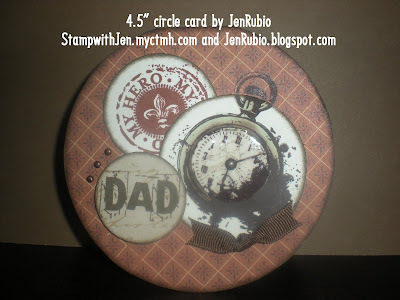 Using Splendor B&T paper that is pre-cut to 2.75" x 4.25", punch out 6-1.25" circles. 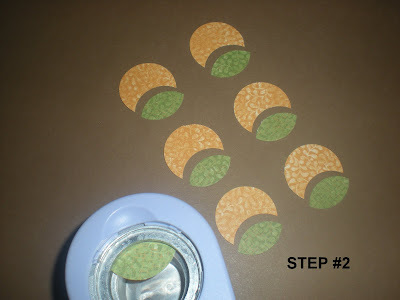 Because the backside of the Topiary leaf B&T paper I used is Goldrush, you can use both sides of the B&T paper and you will be able to use your scraps that you punch from each circle as the leaves (how economical of me, lol)! Punch a "leaf shape" into each circle (I like to stack them and punch three circles at a time so it only takes me two separate punches). It also helps to insert your circle just far enough into the punch that none of it is visible sticking out on the outer-side of the punch. This will just help you in measuring and keeping each of your punched pieces approximately the same size. 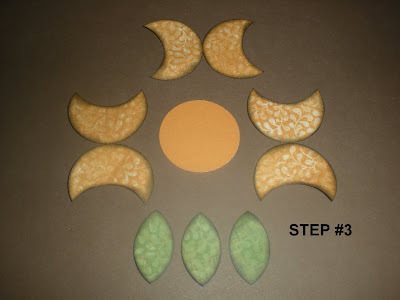 Next you will use a sponge dauber with Chocolate ink to sponge the edges of all 6 of the crescent moon shapes and 3 of your leaf scraps. 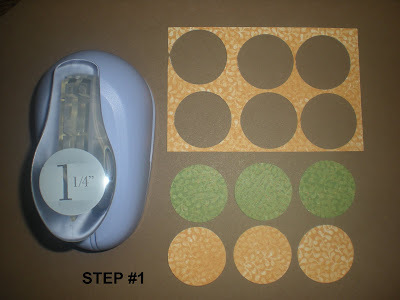 You will also want to punch another circle from Goldrush cardstock to use as the base for your flower. Now use the handle of your piercing tool to wrap the cresent moon petals around and curl them to give them a little bit of shape. 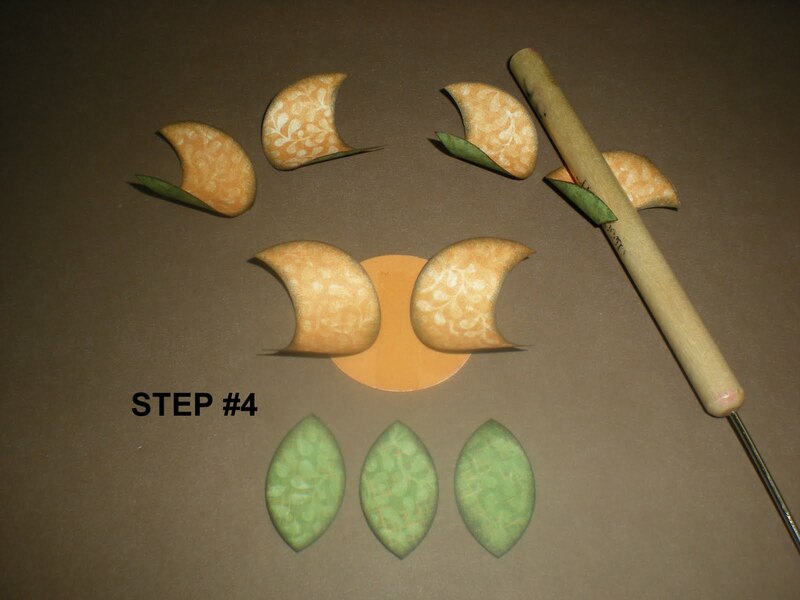 As you adhere the petals to your base, it is okay if they flatten a little, you can just plump them back up with your fingers again when your flower is finished. Cover your Goldrush cardstock circle with tombow adhesive and adhere two of your curled petals just as shown. 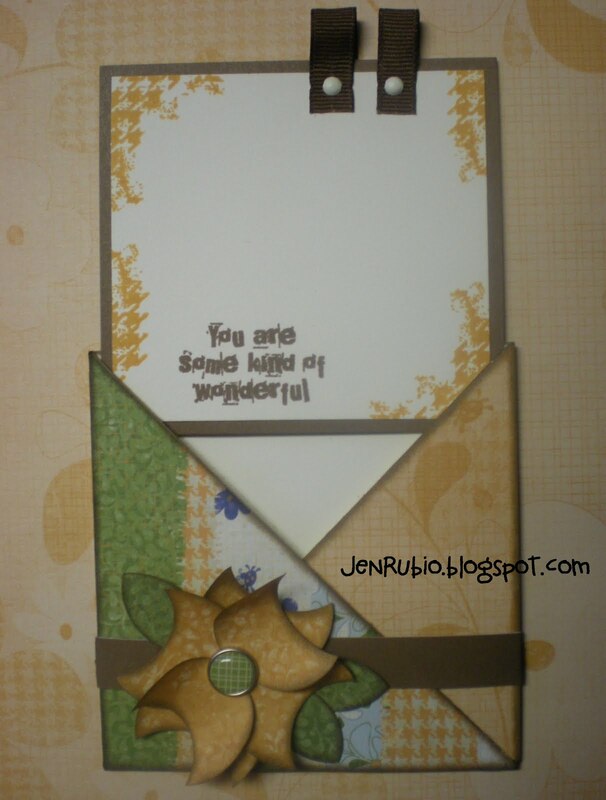 Next you will adhere two more petals going the opposite direction so that you will see a little square or rectangle of Goldrush cardstock peeking out in the middle. Finally adhere your last two petals diagonally from the other four petals, covering the Goldrush cardstock that was peeking out in the middle. 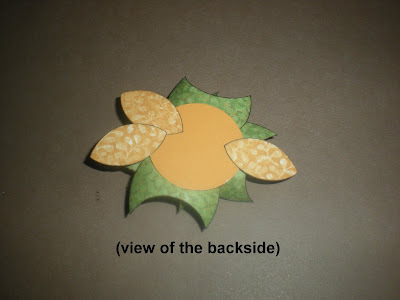 Now you can adhere your three leaves to the back side of the flower as well. Now you can reward yourself with a pretty brad or button in the center of your flower. 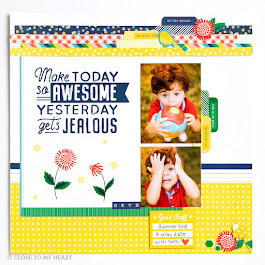 I used one of our new Z1317 Splendor Designer Brads (below). 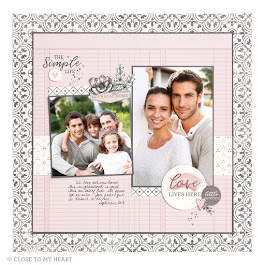 You can use any brad or button that you want, but I really LOVE how much fancier it looks with the designer brads! If you enjoy making these paper flowers and have any success using them on your artwork, please feel free to let me know, as I would love to see what you've created!! 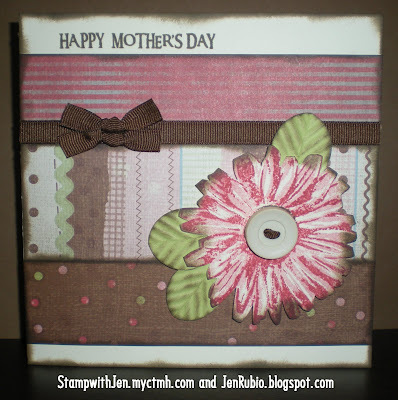 My Mother's Day Card for the latest H2H challenge! 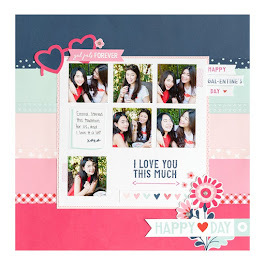 So the Heart 2 Heart blog challenge this week was to create a Mother's Day card, which is just perfect for me because I was wanting and needing to make a Mother's Day card this week anyway!! My 6x6 card above is a design inspired by Wishes - Keep It Level (p. 107). 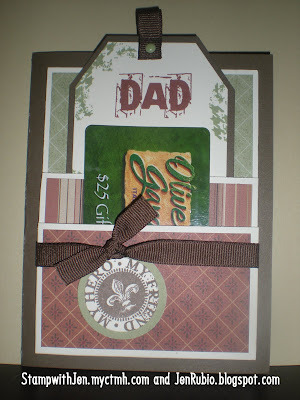 I used Cherry-O papers as well as the Cherry-O Creative Basics papers too. To stamp the flower I used Something Splendid D1424, the upcoming August SOTM, with Blush and Tulip inks. I tried to keep my card somewhat simple (since I have a lot of Moms/Grandmas/Sisters and will need to make quite a few of these). 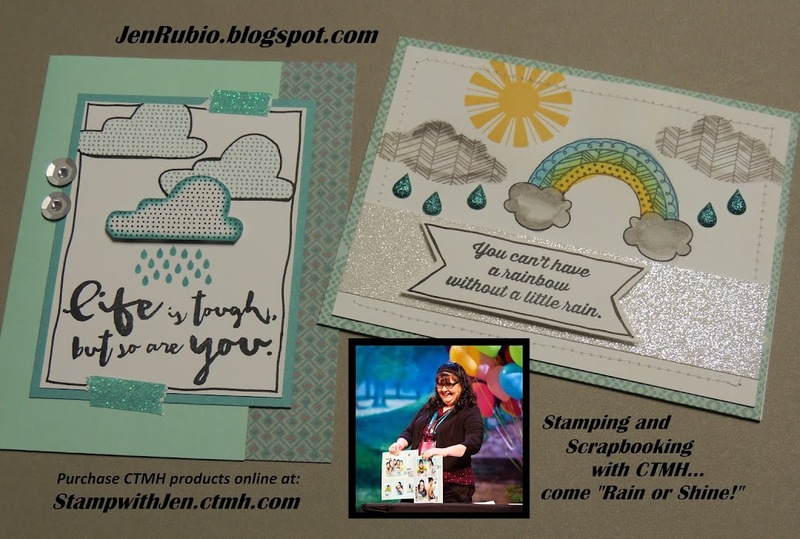 I'm also going to be creating this card with my customers at my NEW Summer Idea Book Open House that I'm hosting at my house today starting at 1pm!